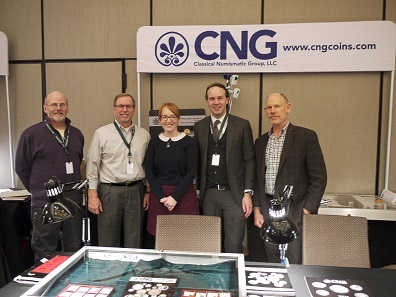 January 24, 2019 – We have had an incredibly hectic time here at CNG as we were gearing up for the busy New York International Numismatic Convention. If you attended, you had the chance to meet several new employees at CNG: one long-term member finally joining us full-time; two longtime numismatic stalwarts who are fresh to the CNG team but known to many of you already; and one newcomer to our field whom most of you will hopefully get to know in the coming days and months. At NYINC you could meet at least some members of the CNG staff. From left to right: Kerry Wetterstrom, Michael Gasvoda, Caroline Holmes, Paul Hill and David Michaels. Photo: Björn Schöpe. 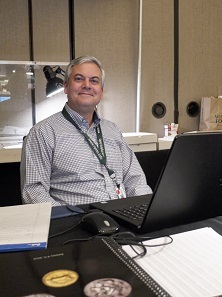 We are very pleased to announce that Jeff Rill has agreed to join our cataloging staff full-time after years of working with us on a part time basis. Jeff has also secured his New York auctioneer’s license and has assisted with some sessions of our NYINC Triton sale this year. Paul Hill and Caroline Holmes have joined us after having worked at Spink, Baldwin’s, and Sovereign Rarities. Many of you are familiar with this wonderful husband and wife team. They have joined our London office and were in New York to greet and work with as many of you as possible. In New York Steve Pruzinsky was very busy at CNG’s Lot Pick-up of the Triton Auction. Photo: Björn Schöpe. Finally, Steve Pruzinsky joins us as our new chief financial officer replacing the departing Cathy England, who is enjoying a much-deserved retirement. Steve will be working with all bidders in our auctions at various times to make sure everyone is correctly in the system. He will also be working to make sure we have resale and VAT certificates on file for everyone who wishes to claim a tax exemption. We have also changed all of our bank accounts and those wishing to work with us via wire transfer should take note of the new account and routing numbers. On the CNG website you can see all staff members with contact details. To read our report on the NYINC where we met CNG’s new members, read our article here.